I met the most important man in the city of Detroit last week…and his name is Curtis. Curtis wasn’t elected to office or appointed to a board or hired to run a big corporation. He is, rather, a self-appointed, very effective ambassador for Michigan’s biggest city. Curtis is a parking valet/bellhop at the Atheneum Suite Hotel in the city’s Greektown area. Downtown Detroit became the capital of Michigan for an evening and a day in early January when former Michigan Speaker of the House Chuck Perricone once again gathered legislative leaders, businesspeople, and newly-elected members of the House and Senate for the seventh Dome Magazine New Legislators Leadership Conference. Broadcasting live from the Legislative Leadership Conference. 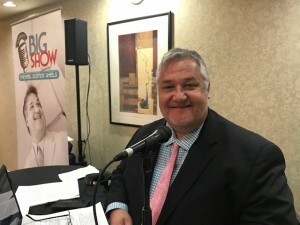 I was honored to broadcast my syndicated morning radio program live from the event. Curtis was one of a number of friendly, helpful staffers at the Atheneum who made Detroit feel like Manhattan, Atlanta, Chicago or any other big business city in terms of professionalism and hospitality. He spoke with joy, used my name frequently, helped move all of the radio equipment to and from the car, and even insisted on helping me with a simple thing like getting a cup with ice for the Diet Coke I was carrying. Curtis smiled broadly when I told him how much I appreciated his manner. “You are a fine ambassador for the city of Detroit and for Michigan,” I told him, knowing fully that thousands of international journalists would be in the city for the North American International Auto Show. Curtis didn’t know I was a travel writer who’d experienced hospitality in hotels around the world, but he, and many of the staffers he was surrounded by at the hotel valet, reception desk, and in the conference area, performed at the top level because they were personable, not bothered by requests, and seemed to care. The shuttle driver who took my producer Tony Cuthbert and I from the hotel to the Dome cocktail reception at the Port Authority building, took a little shortcut on the way to the event’s riverfront location. “Don’t try this at home. This is a professional move by an experienced driver. This will get you there quicker,” he joked. When Perricone moved the biennial new leadership conference from Kalamazoo to Detroit, its previous iterations were staged high atop the Marriott Renaissance Center, a 70-story perch from which participants could just about see all the way to the capital. The view came with a price, though because the massive, sprawling Renaissance Center has always been a fortress – an island unto itself – and tends to consume, if not imprison, everyone who stays in its complicated confines. 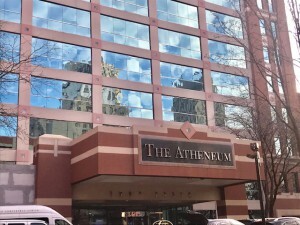 The Atheneum hotel in Downtown Detroit. “My father used to take me to Pegasus to dinner with Ted Gatzaros to celebrate birthdays, so I am honoring the tradition,” Hertel told me during the reception at the Port Authority. The next morning, former Senate Majority Leader Randy Richardville also spoke of his affection for the late Gatzaros, who owned, among other properties, Pegasus, Fishbones, and Atheneum Suites Hotel while paving the way for the Greektown Casino which Dan Gilbert, keynote speaker at the conference’s Port Authority dinner, just divested himself of. I was also only kidding the next morning at the conference during my radio interview with new House Speaker Lee Chatfield, the Republican from Levering who was about to participate in his first Quadrant Meeting with Governor Whitmer and the three other House and Senate majority and minority leaders. “I will record it for you,” Chatfield quipped. Another State Rep. who danced around a tricky question I asked while interviewing him was Yousef Rabhi, the democratic floor leader from Ann Arbor. Naturally I asked him during our radio interview what the letters meant. Thanks to Perricone and his loyal sponsors, the paths of legislators new and experienced crossed in Detroit where the Motor City game them a marvelous welcome during the Dome Magazine New Legislative Leadership Conference.